Tickets for the headline show go on sale at 10am Monday 18th August over at www.livenation.co.uk and are expected to move extremely quickly. The Los Angeles-based trio’s debut EP, Made An America is available at all digital music retailers and streaming services – http://roadrunnerrecords.lnk.to/madeanamerica – with an exclusive bundle available via the official Roadrunner webstore – http://smarturl.it/TheFever333store. Put together by vocalist Jason Aalon Butler [ex-letlive. ], drummer Aric Improta [Night Verses] and guitarist Stephen Harrison [ex-The Chariot], THE FEVER 333 are explicitly devoted to their cause, delivering aggressive advocacy through an incendiary blend of punk, hip-hop and thrash. 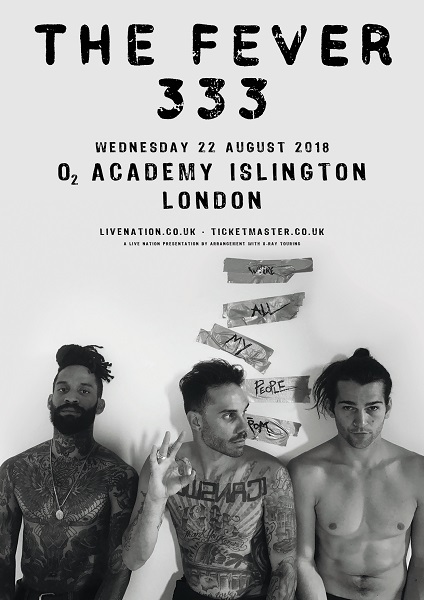 The Made An America EP demonstrates THE FEVER 333’s activism, with the title focus track – https://youtu.be/hYEu_T2z9tw – and Walking In My Shoes – https://youtu.be/RJS40CWa2hc – serving as the banner for THE FEVER 333’s focus on ‘The Three C’s’; community, charity, and change. In the meantime, sign up for news updates over at 333.thefever333.com.